Kia ora. 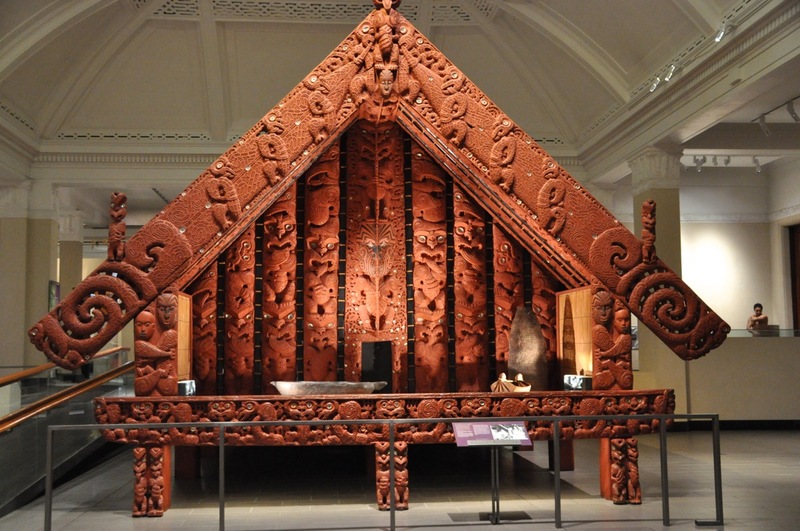 Humor me to continue briefly about Maori influence. Captain Cook named a bunch of bays (eg, Doubtless Bay, from a ship log entry – “doubtless, a bay”). Other than that, at least for the North Island, names are mostly Maori. Impossible, multi-syllable, thousands of very similar names. Names like Whanganui, Waingaro, Waitangi, Waitiki, Whangarei, Whangamumu, Whatuwhiwhi, Whangaroa. Those cities being located just in the small arm of the North Island above Auckland – and there are more like that. 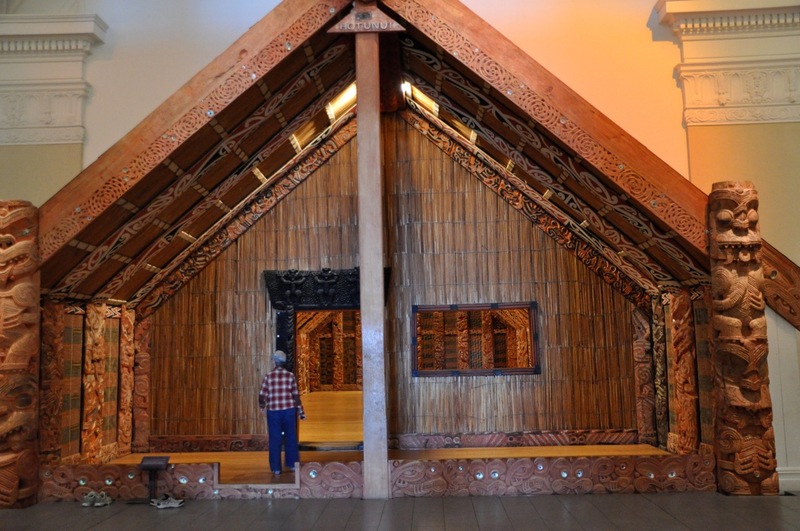 And there are lots lots lots more going south – Whakahoro, Whitianga, Waikaremoana …. my brain shuts off. Oh, and to make it more interesting? Whangarei is pronounced “Fahn-ga-ray”. Confusion reigns, and no, it is not just the “W”‘s. So when reading a guide book and you see a city name, you are guaranteed to have no bloomin’ idea where in the island they’re talking about. My brain thinks all the cities have the same name. OK, small things to big things, let me show you a war canoe. It was built in 1836 from a single log; it is 25 meters long and can hold 100 warriors. The vertical image is the very tall canoe’s tail. We’re getting near the end! Stay with me just a while longer, the best is last. Let me show you some of their fiber arts, done by the women. Below is a kiwi feather cloak, each feather woven into the fabric. A fiber mat and 2 skirts. And fiber baskets. typically represents a story from that tribe or sub-tribe, often regarding ancestors. Support poles are typically images of ancestors. The meeting house had many functions. It was a place for the tribe to receive visitors, to do business, to entertain or have parties, or for weddings or funerals. Museums are tiring. The receptionist told us the museum would take us 2-3 hours to see; we spent 5 hours and did not come close to seeing everything (a diverse museum, it had for instance an Edmund Hillary wing with his gear, pictures, and a large mock-up of Everest on which was projected in a time sequence his team’s daily progress up the mountain. Cool! 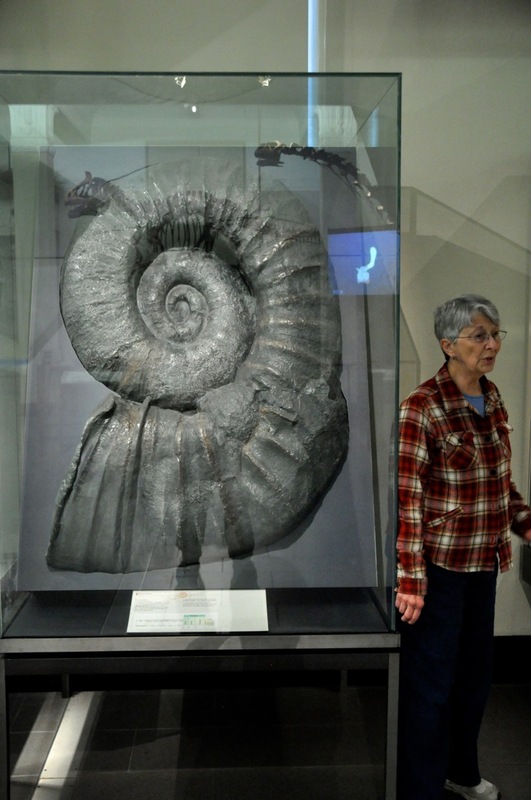 And some pretty incredible fossils, like this one. But enough for now! 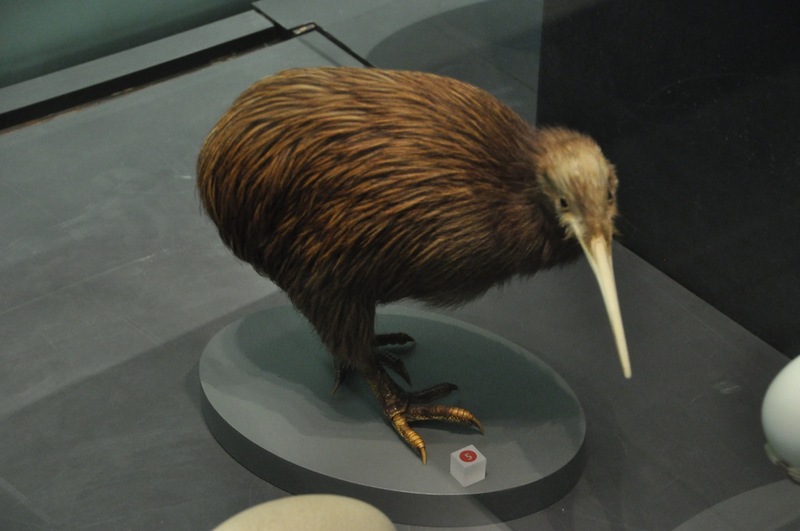 Except for this one last item from the museum, a stuffed Kiwi. Aren’t they cute? For those of you old enough to remember (are any of you old enough to remember?) Al Capp’s Shmoo, don’t they look like a Shmoo with feathers and beak? We hope to see one while we’re here, but Shmoo – I mean kiwi – being in the forest and nocturnal, I dunno. The wood carvings are amazing, but it strikes me that these people had a LOT of time on their hands. Maybe typical for isolated islanders? 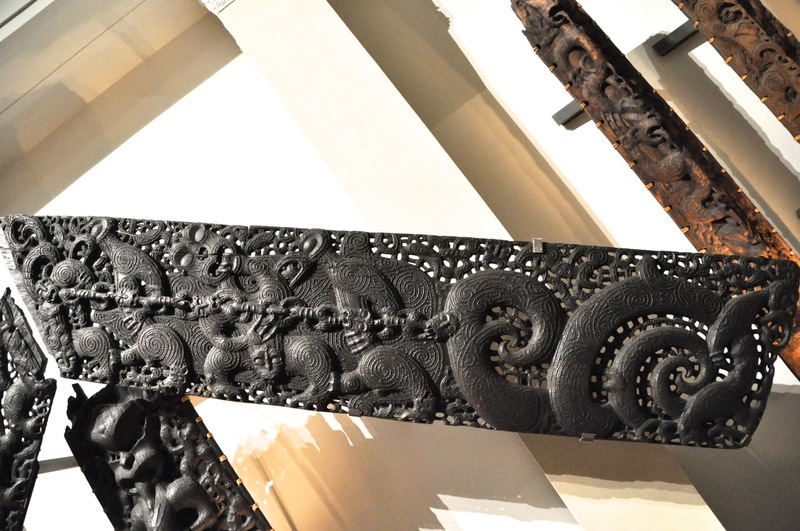 When you refer to “Maori meaning” in the carvings, do you refer to religious or cultural meaning? Well, they didn’t have to commute to work, or read email and blogs …. Amazing stuff. And we think we have culture. Nah, we know better.